Want to see the spectacular Northern Lights in comfort? Our Northern Lights Deluxe Tour offers front-row seats for Earth’s greatest light show. Picture yourself sitting in a comfortable, heated bus, looking up at the dancing lights – right from your seat. Why is the view so good? It’s all thanks to the design of our special panoramic bus – more on this soon. Read on for the details, or go ahead and reserve now! On our Northern Lights Deluxe Tour, you’ll see the fabulous Aurora Borealis from the comfort of our special customized bus. After a smooth, fuss-free pickup in downtown Reykjavík, you’ll climb aboard and get settled in your comfy leather seats to enjoy the ride out of town. 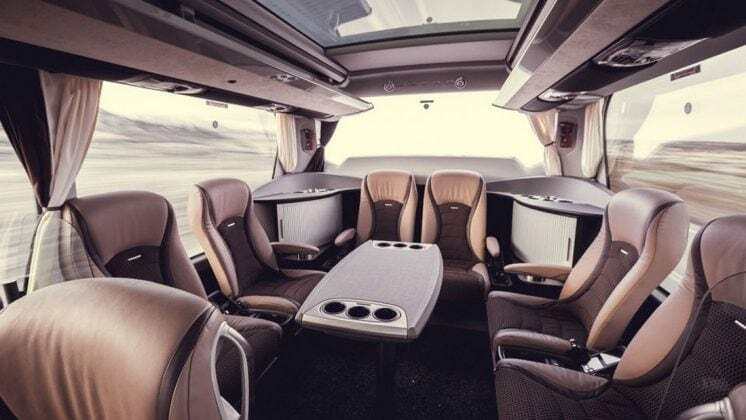 Our specially-fitted luxury coach has a cozy lounge area for viewing the Aurora. It’s custom-fitted with a glass window in the roof of the bus. This means you can enjoy panoramic views of the Northern Lights, right from the warmth and comfort of the bus. The exact location of your trip will be hand-picked on the day by our team according to their predictions. 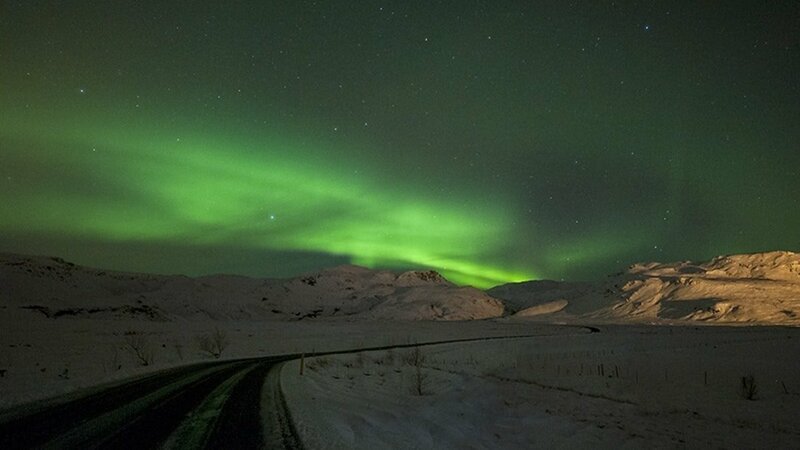 We’ll head out into the peaceful Icelandic countryside for optimal Aurora Borealis viewing. Your expert guide will be on hand to offer insightful commentary on the Northern Lights as you chase them through the starry landscape. The view from the bus is so spectacular, you might not want to get off! But of course, you’ll also have the chance to get out and enjoy a 360° view of the night sky and the beautiful show of green lights. You’ll have plenty of time to marvel at the changing lights and take some great pictures. After the spectacle, you’ll get to indulge in some delicious Icelandic treats. Sink back into your seat and relax on the trip back to Reykjavík. Since the Aurora Borealis is dependent on weather and atmospheric conditions, it’s not guaranteed that the lights will be visible on the evening of your trip. If the lights are not visible on the evening of your Northern Lights Deluxe Tour, no worries! You can reschedule for free as many times as you need on our regular (non-deluxe) Northern Lights Tour, subject to availability. We’ll do our best to make sure your Northern Lights trip is a success! For your comfort: Dress to be prepared for the weather! In Iceland it’s always wise to wear/bring warm, waterproof clothes. This is especially true on nighttime tours in winter, like the Northern Lights excursion! We recommend a waterproof jacket and pants, hat and gloves, warm socks and waterproof shoes. "Mr. A" did everything he could to make this an enjoyable evening, from providing treats to bringing along a photographer who took time exposure pictures to show us the aurora activity that was hard to discern with the naked eye. 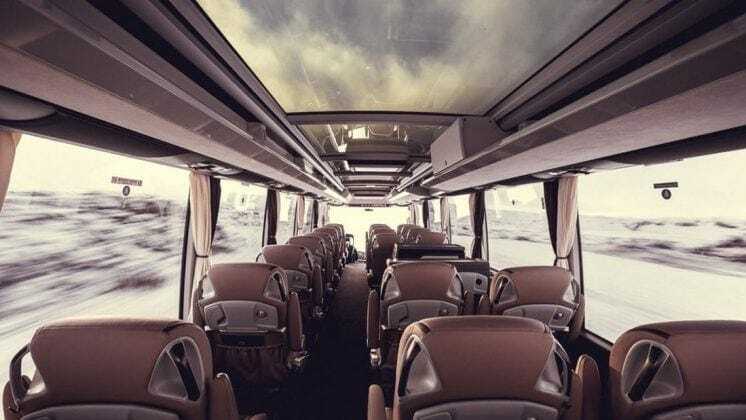 We used BusTravel Iceland for our Northern Lights Tour although there was no sight of Aurora Borealis due to bad weather conditions - too cloudy and the drizzling night the following day, hence the Northern Lights Tour was cancelled. 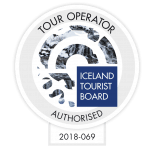 We couldn't have recommended more highly for their customer orientated services, the tour guide was very entertaining and amusing with folk tales, singing and free hot chocolate & Icelandic doughnut etc. It was by far and away the best tour operators we used whilst in Iceland. The Northern Lights are a spectacular natural show of light. Colorful lights twirl across the sky like dancers on a dark starry stage. Their costumes have many colors – green, white, and even red or pink. 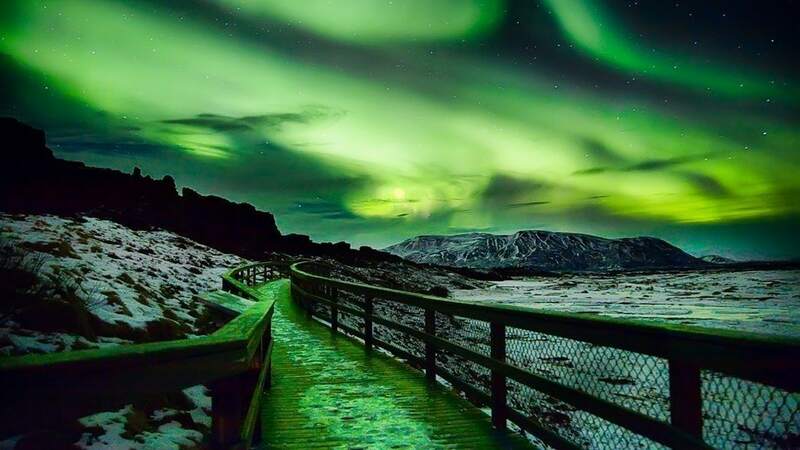 The scientific explanation behind these beautiful lights is related to solar winds agitating the magnetic field of the earth. This ionizes the gaseous particles in the atmosphere. This in turn causes them to give off light. The lovely colors we see differ depending on the altitude of the particles when they are ionized. Our experienced and entertaining guide will share lots more Northern Lights information with you throughout your tour. The Aurora Borealis is visible in regions with high latitude. 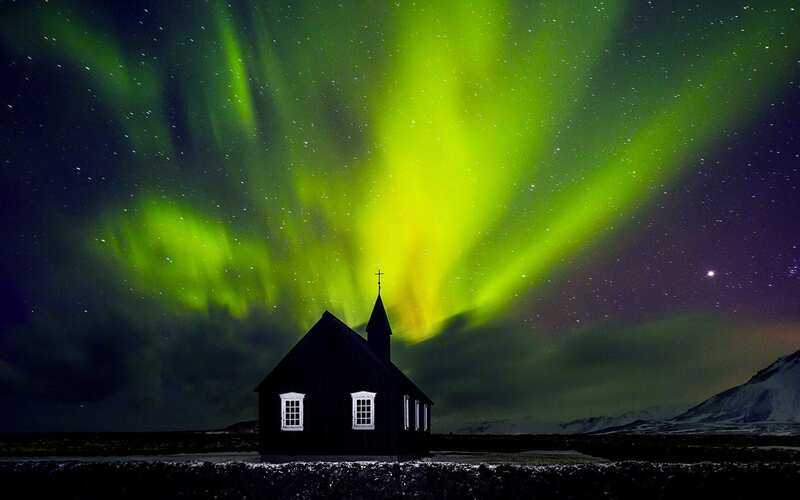 So Iceland is one of the best places to see the Northern Lights. 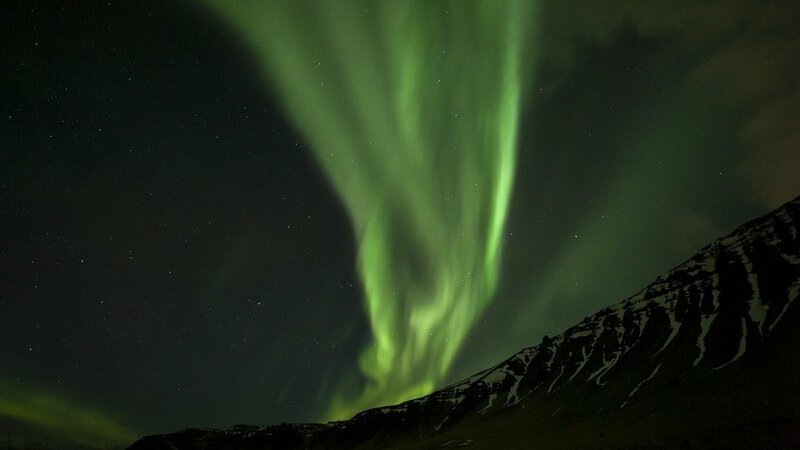 In Reykjavík, Northern Lights viewing is best outside of the downtown area, where there’s less light pollution. 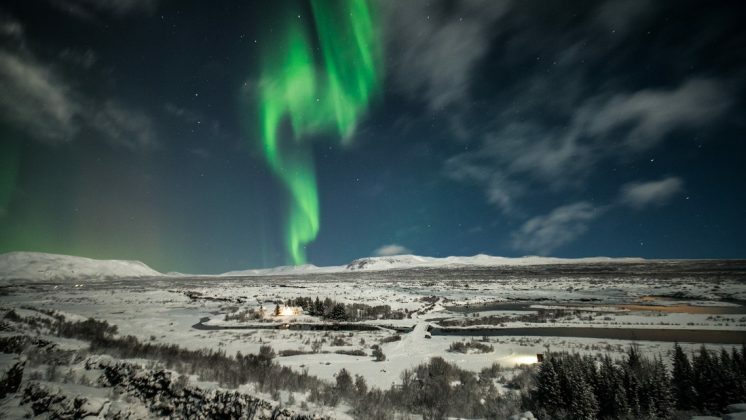 So if you’re coming to Iceland, you’ve chosen a good location for Northern Lights hunting! 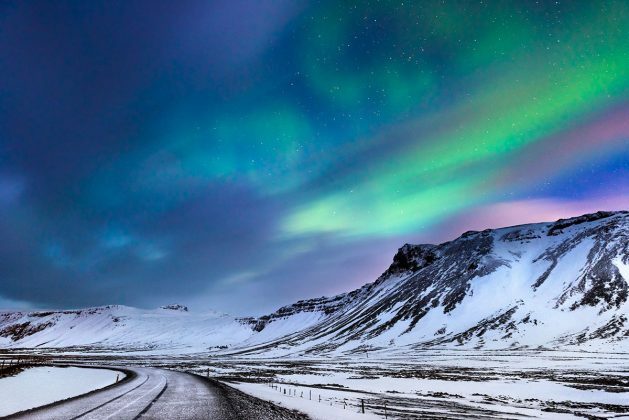 But what’s the best time for Northern Lights in Iceland? The best Northern Lights experience is to be had in the winter months. Prime viewing is between 10 pm and 2 am at night. But even in Iceland’s Northern Lights season, viewing can vary each day according to the weather and atmospheric conditions. They will be closely watching all the data leading up to your trip and are experts at Northern Lights prediction. They will hand-pick the best possible location to see the amazing Aurora on the night of your tour. Pickup is available at selected hotels and at special tour bus stops throughout downtown Reykjavík. The pickup time can change depending on the time of year, so be sure to note the time on your ticket! Also, be aware that pickup can take up to 30 minutes starting from the time on your ticket. Children under 8 are not permitted on this tour, as it’s a late-night excursion and too tiring for younger children. Or, are you keen on small group travel? You can also check out our premium Minibus tour. It’s another great option for a small group Northern Lights Tour. The Northern Lights Deluxe Tour is the best way to see the Northern Lights right from your seat! 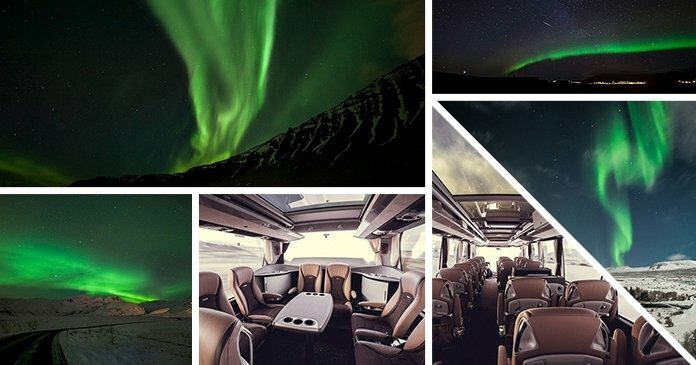 Our special customized bus gives you front-row seats to the spectacular colors of the Aurora. You’ll also have a dedicated guide to help you make the most of your experience. Plus, you’ll even get some delicious Icelandic treats to round out the evening. Don’t miss this fantastic spectacle of nature – reserve now and enjoy the show!